HANOI (Reuters) - U.S. President Donald Trump and North Korean leader Kim Jong Un will hold another day of talks at their second summit in eight months on Thursday, after swapping compliments at a dinner but giving no sign of progress on the key issue of denuclearization. They have also discussed partial denuclearization measures, such as allowing inspectors to observe the dismantling of North Korea's Yongbyon nuclear reactor, U.S. and South Korean officials say. U.S. concessions could include opening liaison offices or clearing the way for inter-Korean projects, but critics say Trump risks squandering vital leverage if he gives away too much, too quickly. 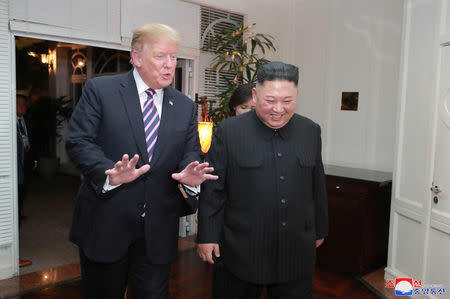 The U.S. president nevertheless appeared upbeat with Kim even as his former personal lawyer Michael Cohen testified at a congressional hearing in Washington, calling Trump a "conman" who knew in advance about the release of stolen emails aimed at hurting his Democratic rival in the 2016 election campaign. Trump told Kim on Wednesday he felt the first summit was "very successful". "Some people would like to see it go quicker; I’m satisfied; you’re satisfied, we want to be happy with what we're doing." Asked by a reporter if he was "walking back" on denuclearization demands, Trump said, "No". Asked if he would declare a formal end to the Korean War, which concluded with an armistice, rather than a peace treaty that North Korea has long sought, Trump said on Wednesday: "We’ll see." The June meeting was the first between a sitting U.S. president and a North Korean leader. It produced a joint statement in which Kim pledged to work toward denuclearization of the Korean peninsula and the two sides committed to establish new ties and build a permanent peace regime.